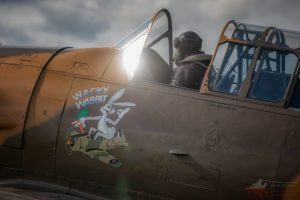 How to use this media profile – This page has been created for anyone wishing to promote the “Wacky Wabbit” AJ841. All the material on this page has been written and researched by Andrew Goodall and is for public use. 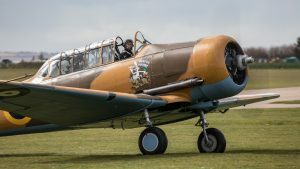 As A company we are dedicated to keeping G-BJST Harvard MK IV (Nose art “Wacky Wabbit”) airworthy for public displays, Heavy tail wheel conversions, film work and Flying Experiences. 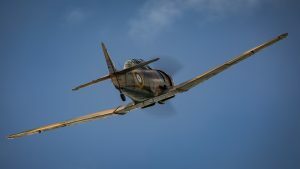 The latter is to give pilots and none pilots the experience of flying in a true warbird. 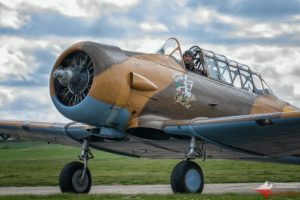 As custodians of a unique piece of aviation history we would like to share our passion with others, so that they can experience the thrills of flying or seeing a warbird up close and personal. 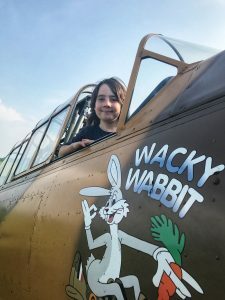 These aircraft are not cheap to run so we have to work her hard, to that end we are always looking for opportunities and sponsorship to keep “The Wacky Wabbit” in the air where she belongs. 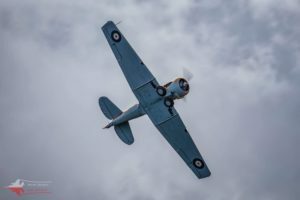 Harvard G-BJST – was built in 1953 by the Canadian Car and Foundry Company (C&CF) as a model T6J.It was built for the USAF under the Mutual Development Assistance Program (MDAP) due to Military officials calling for the introduction of legislation to expand suitable military training equipment. After the negotiation of the North Atlantic defence treaty there was a requirement to provide military aid to strengthen member country’s against the communist threat in Europe. As part of a order placed in 1951 by the USAF aircraft were supplied to the French, German, Italian, Turkish and other Airforce’s to help speed up there recovery after world war two. Apparently under the contract number AF-20641 two batches of T-6 were manufactured by the CCF. The first batch consisted of 143 aircraft with 69 going to Italy, 24 to Belgium and 51 to the French Air Force. 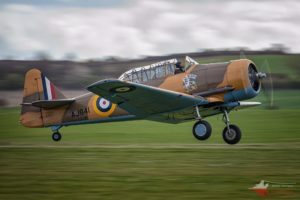 Transformation to AJ841 – A decision was made by the T6 Harvard syndicate in August 2014 to re paint G-BJST in a new colour scheme for 2015 as the current paint was looking rather tired. 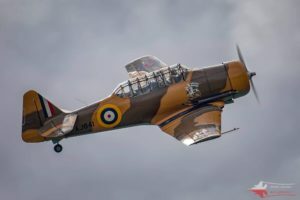 The idea to paint her as a former RAF Desert Air Force (DAF) MKII Harvard was suggested by Andy Goodall to the group and it was agreed. Andy subsequently acquired sponsorship from RS Paintwork (now Purple aviation located at Eshott airfield) and the transformation began. 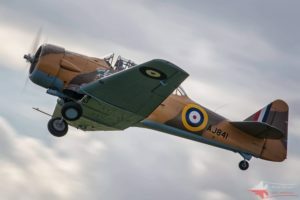 Meticulous research was carried out by Andy Goodall and Martin Pengelly in to a Harvard that served in the North Africa campaign with a Duxford connection. 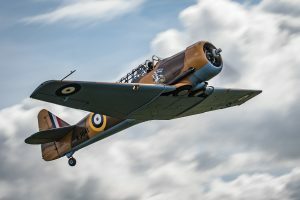 AJ 841 was found to have a connection with Duxford as she saw service with 154 Squadron. Originally 154 Squadron were based just to the West of RAF Duxford at RAF Fowlmere before they were deployed to the Middle East in 1942. Record cards for 154 Squadron show the squadron Harvard (AJ841) being flown by flying officer D C Dunn from Minnigh (Syria) to Ramat David (Palestine) on the 12th February 1944. AJ841 – AJ841 was also logged with “243 squadron” on the 11th January 1944 flying from “Syria” Allepo to Petah Tiger in Palestine with the pilot named as F/Sgt Ernewein and passenger marked as ‘Self” The return journey was made from Palestine back to Aleppo on the 16th January 1944 this time with the pilot “Self” and the passenger F/Sgt Ernewein. The log book is marked on this page as “243 Squadron Allepo Syria 1944” It seems AJ841 had a busy life as a general hack used by many squadrons. 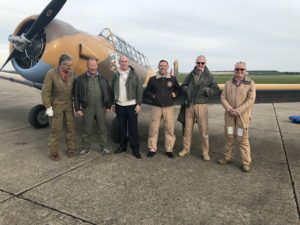 The RAF were approached in 2014 and permission was given for G-BJST to now carry the codes AJ841 and the RAF colours and markings – Then the transformation began! Why the “Wacky Wabbit”? 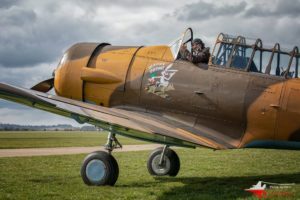 – This was added purely for marketing purposes, however the (W) Rabbit in the Harvard was a wartime patch from the No 5 British Flying Training school in Florida. 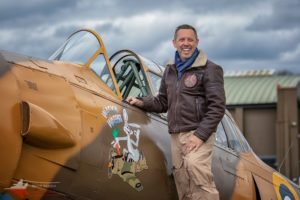 Andy Goodall slightly modified it and gave it the name “Wacky Wabbit” he wanted to call it “Wicked Wabbit” however that was taken by a famous P47 Thunderbolt! The kids love it and it gives this beautiful Harvard an identity. 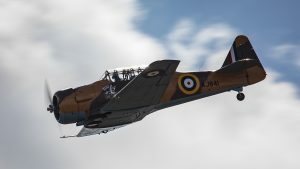 1951 – Constructed as a T-6J by Canadian Car and Foundry at Fort William (Thunder Bay), Ontario, Can. Taken on Strength/Charge with the United States Air Force with s/n 51-17110. S/n issued for administrative purpose only – did not serve with the USAF. From 21 December 1981 to 26 July 1994 To Victor Samuel Eric Norman, Gloucs with c/r G-BJST. From 21 December 1981 to 26 July 1994 Painted as a Zero for the film Empire of the Sun. From 5 November 1996 to 2 January 1998 To Gerhard Robert Adolf Schilling. From 2 January 1998 to 31 August 2000 To Anette Schilling. From 31 August 2000 to 30 November 2004 To Tuplin Holdings Ltd.
From 30 November 2004 to 24 February 2005 To Classic Aero Engineering Ltd.
From 24 February 2005 to 11 August 2009 To Peter John Tuplin. By September 2005 Markings Applied: KF729 Royal Air Force marks worn. 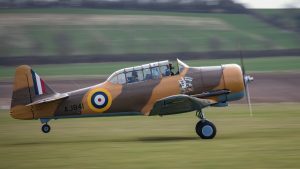 Painted in the colour scheme of the aircraft HRH Prince Philip flew during his advanced training. His Harvard at that time, bore the five stars denoting his rank of Marshal of the Royal Air Force. From 11 August 2009 to 22 July 2010 To Classic Aero Engineering Ltd, Thruxton, Hampshire, UK. 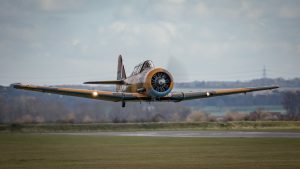 From 22 July 2010 to 15 July 2014 – T6 Harvard Aviation – Partners – Operates with T6 Harvard Aviation Ltd for introduction and Experience flights. 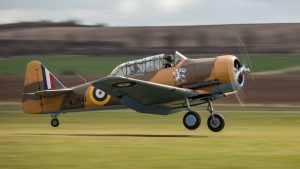 2014 Painted as AJ841 by RS Paintworks at Fishburn – Later Purple Aviation at Eshott Airfield in Northumberland. The below 9 photos that you may save and copy plus Seven high resolution photographs by the extremely talented – Piotr Szydło Please view his Facebook page. Please cut and paste for any T6 Harvard aviation business with full permission from the photographer.